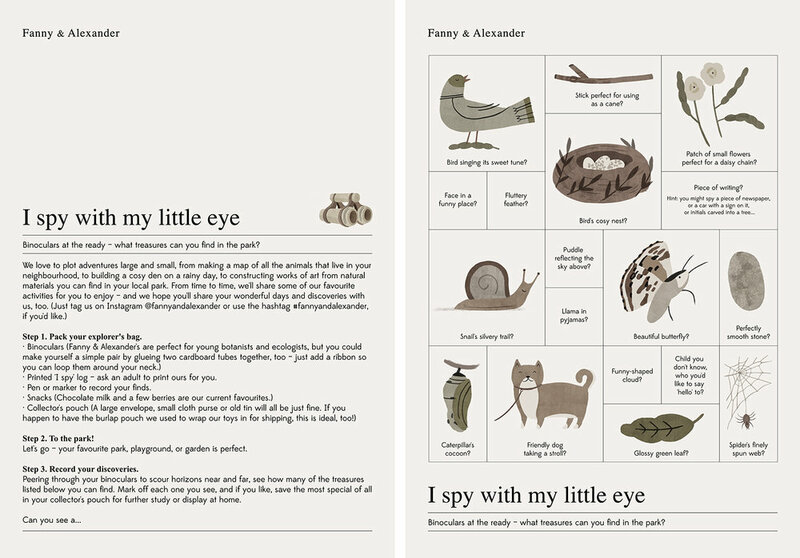 We love to plot adventures large and small, from making a map of all the animals that live in your neighbourhood, to building a cosy den on a rainy day, to constructing works of art from natural materials you can find in your local park. From time to time, we'll share some of our favourite activities for you to enjoy – and we hope you'll share your wonderful days and discoveries with us, too. Just tag us on Instagram @fannyandalexander or use the hashtag #F&AOutdoorPlay, if you'd like. Para chicas y chicos de 4 a 10 años, acompañados por un adulto. Costo: $30 por persona. Cupos limitados. Entradas a la venta a partir de las 12:00 el mismo día. *Se venderan hasta 4 entradas de niños por adulto. Para chicas y chicos de 5 a 15 años. Entrada gratuita. Hasta agotar la capacidad de la tienda. This year the Museum of Latin American Art of Buenos Aires's design initiative devoted to children appointed Delfina Aguilar, founder of Fanny & Alexander, a children's label, as guest curator. The Fanny & Alexander brand offers an array of objects rigorously crafted by artisans from noble materials. From wood-carved toys and hand-knitted jumpers to an interiors line, F&A is committed to enriching the lives of children through beautiful, simple and enduring objects that embody a nostalgic notion of play. The exhibition seeks to highlight the value of craftsmanship in the production of objects with which children interact daily. Specifically, children will observe the process involved in the craft of soap-making, binding, silk screen printing and knitting. Children will be able to apply these techniques in a space especially designed for them to engage with the materials first-hand. In this way, the event will be an opportunity to explore ways of playing that are also ways of creating. The goal is to convey, through a playful experience, the idea that craftsmanship is a fundamental part of the value of the finished product. By encouraging children to experiment with different techniques through which materials are molded into new objects, this project aims to stimulate active forms of play that foster manual skills and exercise imagination and creativity. Fanny & Alexander thus hopes to instill in children the value of enduring objects produced from noble materials through careful craftsmanship while at the same time inspiring parents to keep these value alive. Participan: Martin Sabater, Victoria Cascón y Franco Peralta. Presentación: martes 17 de julio de 16:00 a 19:00 en Tiendamalba. Para chicas y chicos de 3 a 11 años, acompañados por un adulto. Entradas libre y gratuita. Cupos limitados. En la novena edición de malba.niños, ciclo de diseño, Tiendamalba convoca a Delfina Aguilar, quien junto con sus colaboradores mostrarán como se hacen algunos productos cotidianos. Los niños podrán luego aplicar lo aprendido en un taller.